For the academic journal, see Tetrahedron (journal). A tetrahedron (plural: tetrahedra) is a polyhedron composed of four triangular faces, three of which meet at each vertex. A regular tetrahedron is one in which the four triangles are regular, or "equilateral", and is one of the Platonic solids. The tetrahedron is one kind of pyramid, which is a polyhedron with a flat polygon base and triangular faces connecting the base to a common point. 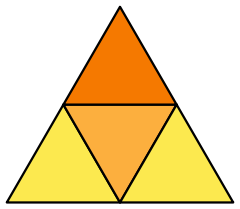 In the case of a tetrahedron the base is a triangle (any of the four faces can be considered the base), so a tetrahedron is also known as triangular pyramid or Digonal Deltahedron. F. M. Jackson and Weisstein, Eric W., "Tetrahedron" from MathWorld. Weisstein, Eric W., "Tetrahedron" from MathWorld. An Amazing, Space Filling, Non-regular Tetrahedron that also includes a description of a "rotating ring of tetrahedra", also known as a kaleidocycle.